David Binder interviews SixtyEightFive founder, Ian Williamson. Many have argued that the evangelical church in the UK has been largely dominated by the middle class. More should be done to reach those in poorer, working-class areas. Christ’s Great Commission demands it. One example of working-class gospel ministry already taking place is through the charity Sixtyeightfive, founded by married father of two Ian Williamson. Working in some of the most deprived wards in the country, this ministry seeks to evangelise and disciple men and women in the North East England town of Middlesbrough who have been raised in a fatherless environment. I caught up with Ian to chat more about his own testimony, the work of the charity and how it is reaching the working class for the gospel. en: Tell us more about your personal connection with the issues the SixtyEightFive ministry engages with. IW: I was raised in Middlesbrough by my mum, who was a lone parent. I longed to have my dad around and as such I suffered from fear, anger and found it difficult to understand what it means to be a man. I didn’t have anybody to tell me about cars, football, how to fix a puncture or to shave, for example! My mum became a Christian when I was 14 and the family went to church with her. The youth group at the church had an invisible but very noticeable divide between the estate kids and the church kids and I soon became dissatisfied and started knocking around with friends from school rather than the kids from the church. This article was first published in the December issue of Evangelicals Now. For more news, articles or reviews, visit us online or subscribe to en for monthly updates. Subject: James Cary, who is married with two children and lives in Somerset, is a scriptwriter. Age range: 30 – 40. RJL: You write comedy scripts for a living. Does the BBC employ you? JC: My parents are churchgoers and they sent me to a school where the Christian faith wasn’t just taught and explained, but lived out by members of staff in a way that was both distinctive and attractive. At the age of about 11, I realised that Jesus’s way was not the world’s way, and that I needed to follow him, rather than go with the flow. So I opted in. RJL: How did you become a scriptwriter? Roger Loosley asks these questions from the pleasurable position of being a retired lawyer. This article was first published in the December 2015 issue of Evangelicals Now. For more news, articles or reviews, visit us online or subscribe to en for monthly updates. We evangelicals love complexity. Commentaries become longer, training resources become more like degrees, and some sermons almost have footnotes. What Gerard Chrispin has done is therefore extremely useful. He produces full Bible notes for individuals, or groups, or as part of a correspondence course (itself available at two levels), at an accessible level. 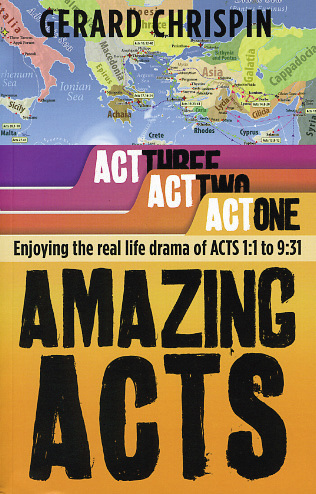 This book is the first of three covering Acts, matching some prior studies on Mark. This article was first published in the December 2015 issue of Evangelicals Now. For more news, articles or reviews, visit our website or subscribe to en for regular updates. With 140,000 people working and 40,000 living in London’s Canary Wharf, how are they going to hear the gospel? It was this challenge that occupied the thoughts and prayers of working Christians and members of St Peter’s Barge as they met to hear Rico Tice explain the vision for ‘Questions of Life’ (www.questionsoflife.org.uk). This outreach aims to give everyone in the Wharf a chance to engage with the gospel – specifically through a week of talks arranged for 14-20 March. Mark Greene has written: ‘Changes in work and transport patterns mean the people we spend most of the time with often don’t live near the church. Many of our strongest contacts are at work.’ This is why opportunities like ‘Questions of Life’ are so vital. Other speakers are Christians drawn from the business and political world. They include Jeremy Anderson, chairman of Global Financial Services at KPMG, David Burrowes MP and David Gascoigne, head of Power and Utilities at KPMG. Others will share testimonies about God’s work in their lives – Yvonne Edwards, a Wharf worker, whose life descended into alcoholism and rehab, will share about coming to faith in Jesus and having her life turned around. ‘Questions of Life’ builds on an initiative last year called ‘Festival of Thought’, which sought venues within Canary Wharf firms to provide lively lunchtime talks using a team from The Oxford Centre for Christian Apologetics. Following an encouraging response and the opportunities of being able to host such events inside company offices, ‘Questions of Life’ aims to follow on. This article was first published in the March issue of Evangelicals Now. For more news, artciles or reviews, visit us online or subscribe to en for monthly updates.